Ping-Pong Game : Done by Murathan Alpay, Evren Cesur, Ferdi Tek�e. This project is about the design of two-color (black and white) ping-pong game for 2 players and implementation on a Xilinx FPGA. It is divided into three parts: keyboard control, game core and VGA driver. 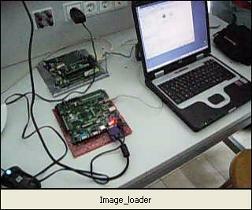 Input from the users is taken directly from the FPGA development board buttons, or through PS/2 keyboards. The game is displayed on a VGA monitor. The circuit is defined in VHDL, and it targets a Xilinx Spartan-3 XC3S200 on a Digilent D3SB development board. The circuit was designed on a Windows XP PC using the Xilinx ISE 9.1., Mentor MODELSIM 6.2b tools. Spring 07. Reading from / Writing to External Memory: Done by Murat Tumer, Furkan Emre Sahin, Cagsun Acemoglu. 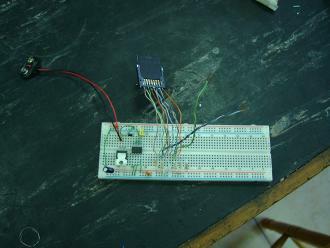 This project is about reading from and writing to an external memory and its implementation on a Xilinx FPGA. 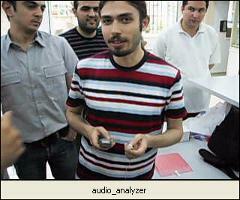 The system is defined in VHDL and uses a custom-make microprocessor. Spring 08. 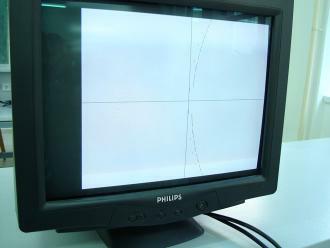 Plotting a Polynomial Graph on a CRT Screen Through VGA Port: Done by Yildiz Koken, Yavuz Yetim and Ozlem Bilgir. 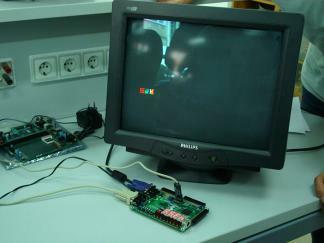 The designed digital system drives a CRT screen through a VGA port. It plots a parabolic or cubic polynomial function on the screen. Polynomial coefficients are entered using push buttons. Spring 08. Screen Saver: Done by Soner Dedeoglu, Omer Faruk Ozdemir, Hasan Cem Demetci. The designed digital system drives a CRT screen through a VGA port. It plots a moving logo on the screen as a screen saver if there is no input to the system for the last five seconds. Spring 08.